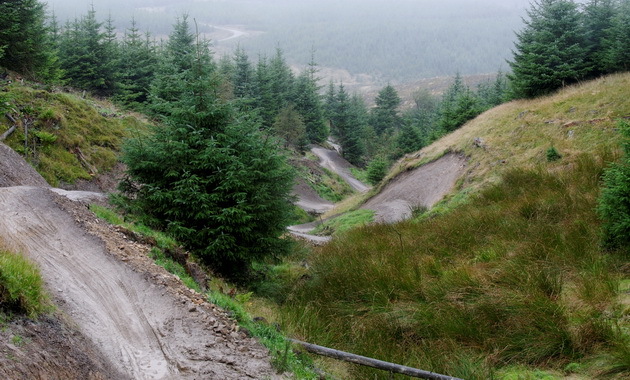 Gisburn is currently undergoing a massive evolution in it’s trails. For years there were 3 pretty basic and mainly fire road trails. This changed in 2008 when Martin Colledge, the Beat Forester for Gisburn with help from Nigel Pilling started to hand build some new singletrack. They quickly realised they needed help and a volunteer group was set up to speed the trail construction. In 2009 a significant injection of cash from Sport England (i?? 60k), another i?? 60k was provided by Forest of Bowland AONB, Ribble Valley BC, Ribble Valley Strategic Partnership, UU and the FC. The FC also contributed the equivalent of another i?? 60k in materials. This all allowed contractors to add around 6km of singletrack to the 1km the volunteers had already laid. So now we have two loops, the 8 which is red graded with black options (18km) and Bottoms Beck trail graded blue (9.5km). The 8 is split into two distinctive loops, the bottom one has extensive sections of volunteer built singletrack and shares some of the blue route. The top loop was contractor built and has bigger fetures. The bottom loop contains the tight and twisty hand built section called Homebaked (as it was built by the volunteers). For many riders this is their favourite section, as it was hand built there was no need to clear a path through the trees for machinery keeping it very tight and often very dark. Those with oversize bars beware, there is one point with literal only inches to spare either side. There are few sections in other trails centres with a similar feel. The highlight (or nemesis) for many is the rocky staircase near the end. It’s a lot grippier than it looks, honest! Moving on towards the crossing with upper loop is a new section of woodwork, boardwalk, skinnies and some fantastic logs, a good 4ft off the ground. This short but sweet section really tests your slow speed handling skills. Onwards and upwards past the location for the new freeride area on and you reach the quarry which is the start of the upper loop. Continue past the quarry on the fire road and you’ll quickly come to the DH section. Following on with the XC route, climb over the exposed rock in the quarry to get to one of Gisburn’s unique singing boardwalk sections built using split larch logs. The trail now climbs upwards to reach Whelpstone Crag. Here you’ll find a number of black line options and the infamous slab. After playing on the hill top you drop down through a series of superb sandy berms to reach one of the star attractions, Hully Gully. This section is also known as the roller coaster. It starts with a few small berms before hitting the gully proper and berms which are over 20ft tall. Surviving those throws into a serious of sharp drops on various surfaces before flinging you out through the ruined farm buildings at the bottom ready for a couple of water crossings. More new berms enhancing some of the old singletrack before returning to the log rides again (if you’ve still got the bottle and legs to have a second go). A gentle fire road pootle brings you to the first of the purpose built blue sections. A fun swooping section with yet more berms, also the venue for many of Ed Oxleys outdoor classroom sessions. A final short section of fire road brings you to the last section of blue, boardwalk and an uphill trundle brings you out above the carpark with nothing but downhill and countless berms between you and your car. There are a number of ongoing projects. The volunteers continue to build more singletrack, currently they’re working on a section to bypass a large loop of unpleasant fire road. Ed Oxley and Tim from the Dog and Partridge have another volunteer project underway to create a freeride section. Martin is pulling together plans for a larger car park and skills area. In addition if more funding becomes available there are plans for a 2km extension to the red loop beyond Whelpstone Crag as well as numerous singletrack developments to remove fire road from the lower loop. All we need is time, people and money! The official trail head is Cocklett Hill car park (directions below) you can also start at the Dog and Partridge in Tosside. Although it’s not the official start of the trails it does have the rather good advantages of beer, hot food and a bike wash (donations go to fund additional trail building). Parking is currently free at both locations. The Gisburn trail building group is independent of Singletraction and meets every second Sunday in the month (other dig days are available from time to time). To get on the mailing list drop Jon an email to sandjkunj@talktalk.net. Ok so if we’re independant of Singletraction why are we on here? Well many of the Singletraction regulars dig at Gisburn and we have had a lot of valuable support and advice from the Singletraction team which is most appreciated. Most importantly we trail builders need to stick together.